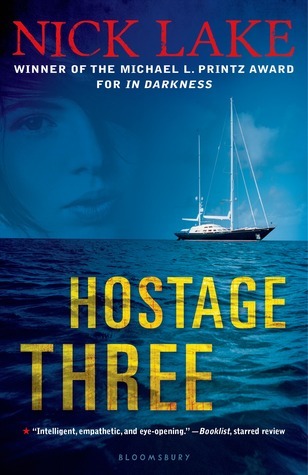 ‘Hostage Three’ is Amy’s designation by the Somali pirates who are holding her for ransom. Amy’s wealthy banker father felt that a yacht trip around the world is what would help bring the family together. Amy is dealing with the suicide of her mother and her father’s remarriage and has become sullen and withdrawn. Time spent sulking, reading and listening to music comes to an abrupt halt when Somali pirates come aboard the yacht and hold the family and crew at gunpoint. She gets to know one of the younger pirates and feels compassion and understanding. Author Nick Lake has created another highly readable, intense novel. He explains what has happened in Somalia to lead to the rise in pirating. Amy’s voice is clear and the character development is believable. The violence in the book is part of the story and the graphic detail is kept at a minimum. Still, this book is best for older teens. This entry was posted in realistic fiction, suspense and tagged Somali pirates. Bookmark the permalink.